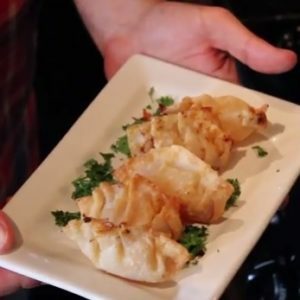 Brie & Jam Crispy Won Tons | Get In The Kitchen | Cooking. While. Awesome. 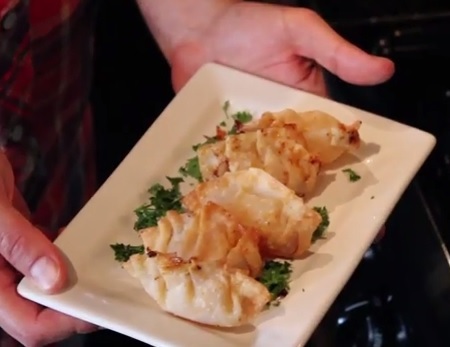 Place won ton wrappers on a plate. Put about a tsp each of Brie and jam in the center. Sprinkle with a pinch of salt, pepper, and bbq spice. Wet the edges of the wrapper and fold over. Pinch and fold to seal. Or as instructed at the cooking party. In a deep pot, fill a quarter to a half way up with vegetable oil and heat oil. To test if oil is hot enough, drop a little piece of the won ton wrapper in. If it starts to bubble around the wrapper, then it is hot enough. Place, don’t drop, the won tons in the oil and cook for about 2-3 minutes until they are golden brown. Remove from oil and place on paper towels to get rid of excess oil. Let cool for at least 5 minutes before eating.